Learn about energy medicine and how it works. Alice Tobin is a certified Eden Energy Medicine Practicioner. Settings, events and the people around us affect our energies. In adapting to these outside forces, our energies can form unhealthy habits that persist. Energy Medicine re-patterns our energies to a full, free and dynamic flow. Tapping, massaging or connecting specific acupressure points on the skin. Tracing the hand over the skin along specific energy pathways. Using simple exercises or postures designed for specific energetic effects. Click here to see an example. "The next big frontier in medicine is energy medicine." Mehmet Oz, M.D., director of the Cardiovascular Institute at Columbia University's College of Physicians and Surgeons. "In every culture and in every medical tradition before ours, healing was accomplished by moving energy." Albert Szent-Gyorgyi. Nobel laureate in Medicine. Sharpen your memory and mind. Re-balance your thyroid. click here to view testimonial. Eliminate allergies (click here to view testimonial), stress, PMS and hot flashes. Increase your joy, contentment and emotional well being. "The Energy Medicine I practice is a collection of modalities from many civilizations and cultures. For example: Meridians, Triple Warmer and Five Elements, from Traditional Chinese Medicine, Chakras from India, Aura, Radiant Circuits, Electrics. And Sound, which is universal." 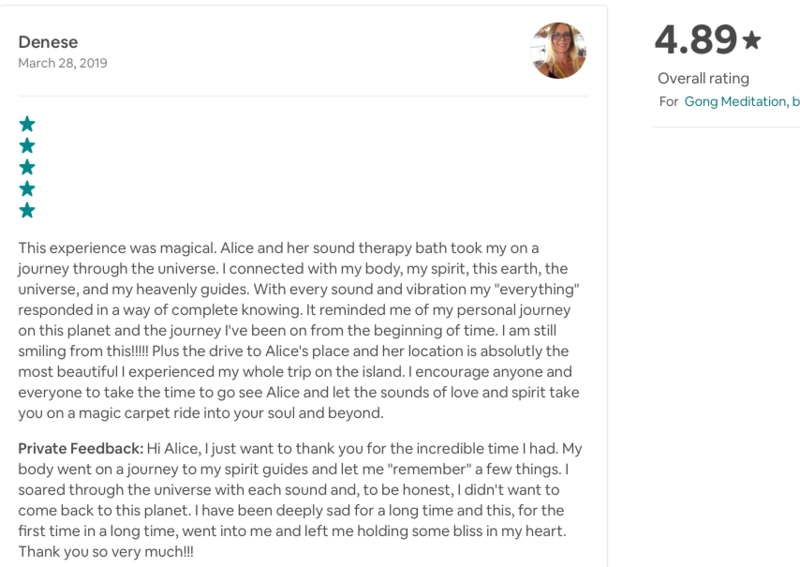 Alice Tobin, Eden Energy Medicine Certified Practitioner, Sound Therapist, and Reiki Master. Alice is a knowledgeable and skillful healer who has surprised and amazed me with her energy healing practice. I am very grateful to her and I know others will be too when they are fortunate enough to make an appointment. I visited her with two chronic problems (one physical, the other mental) that I had resigned myself to live with and have been feeling great since. I am confident that the effects are long-lasting, if not permanent. Her approach is both simple and powerful. The first problem is physical. I have a recurring, twelve-year long back problem which I usually treat with bed rest, heavy pain killers, muscle relaxers, chiropractor, and ice. I tried to uncover any underlying primary cause using MRI, XRAY, and bone density examinations. The resulting two-page list of problems were all minor to moderate and perfectly normal for a 56 year old. I was advised by a orthopedic surgeon to take more pain killer and to continue to see the chiropractor when problems flair up. Recently after several weeks of chiropractic care I became frustrated because the pain and discomfort had not gone away after many visits. Alice said she could help me with that. She pointed out that her treatments work well with chiropractor adjustment. Afterwards I felt immediately pain-free and stopped taking any ibuprofen at all from that moment on. This was unbelievably freeing after 2 weeks of maximum dose! (plus Skelaxin) She taught me a daily energy routine which I practiced 3x a day for several weeks and now I’m down to 1x day with some extra repetition as I think of them. The effects are cumulative. Oh yes and for about a month I took a teaspoon of a type of silver liquid every morning at her recommendation. Meanwhile my chiropractor found my back had stabilized and his adjustments had became minor. He tells me I’m more aware of being out of alignment now and I can get fixed before things go wrong in multiple places! With this success behind me, I decided to ask Alice to help me with a second problem: chronic anxiety. We scheduled a second session. I’m a typical “Pitta” personality with multiple lists going, an ambitious creative outpouring, fitness goals and a busy social schedule. I work in a small office where negative interactions occur frequently. In other words my anxiety is triggered on multiple fronts. To combat this I practice yoga, meditation, vitamin B and Fish Oil (recommended in the book, Your Brain on Joy by Earl Henslin). Alice spent an hour with me. She did more hand waving (sorry Alice!) and put pressure on different spots. She taught me how to massage my own adrenal glands, which are surprisingly tender. During the session I felt relaxed and unaffected/unchanged. When I got up however I noticed I felt settled and calm, completely lacking in anxiety. Since then, no to-do lists have been running through my brain. I don’t go back and forth from one room to the next forgetting what I went in there for. If I want to do something, I sit down and do it. Things are simpler. I’m not worried about the things I’m not doing. Alice suggested I “zip up” (the last part of the daily routine) before I go into work. It will protect me. So strangely this too has been true! At work I have been very uninterested/unaffected in the other worker’s drama. It’s not even an issue, like it’s happening in a remote space, not near me and with no effort I can avoid being involved. Thanks to Alice I feel great. My back doesn’t hurt. Other people’s stuff is far away. My own pressure on myself has become less. No nightmares. No lists. I feel relaxed and ready. I sleep better at night. I am energized but relaxed; stable and alert. I’m in this zone of settled-ness. So far it has lasted several months and I feel confident somehow this is a new me. — Dede Ondishko, Ph.D. travels around the U.S. doing children musical programs.